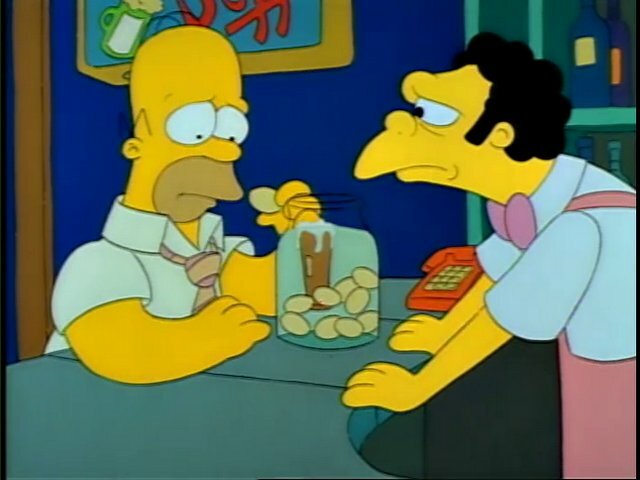 Lisa: You have thirteen pickled eggs in that jar. And one cockroach. 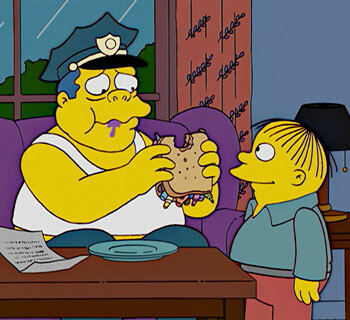 Moe: Who are you, sweetheart, the health inspector? Health Inspector: No, but I am. 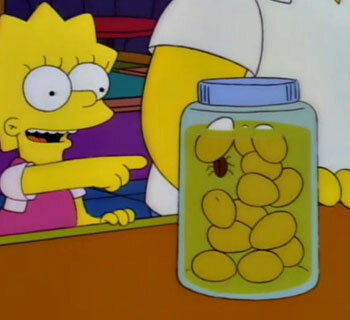 Note: today’s entry (Moe’s Pickled Eggs) was written by fabulous guest writer Dan Rudy! 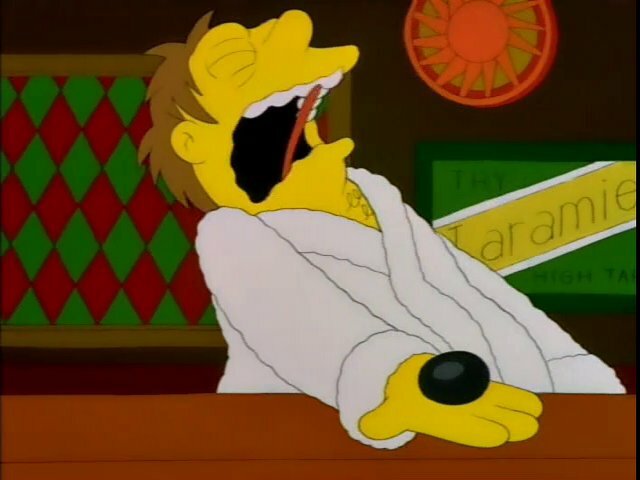 Uncle Moe’s Family Feedbag is all well and fun, but once the last of the fire extinguishers with their painful memories of Moe Madness are gone, nothing says “dank pit” like an egg pulled from a big jar of brine. From the last episode of the very first season Moe has kept them at the ready. They serve so many purposes too: from picking designated drivers, to killing off health inspectors, to something to take on vacation. Boil and peel your eggs in advance, setting them aside. 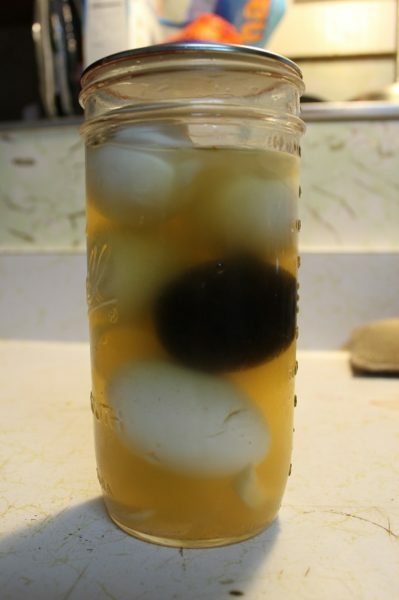 Boil the jar and lid ahead of time too, to sterilize them before putting in the eggs. In a saucepan bring the brine, salt and vinegar to a boil, then pour over the eggs and cover. Put the jar in the fridge for a few days to a week to pickle before eating. 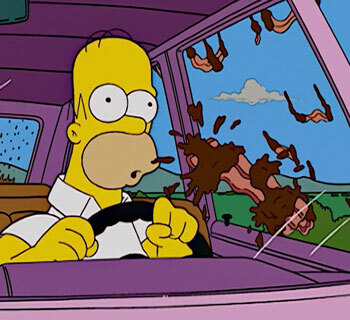 Moe: Listen up, guys, the Springfield Police have told me that 91% of all traffic accidents are caused by you six guys. 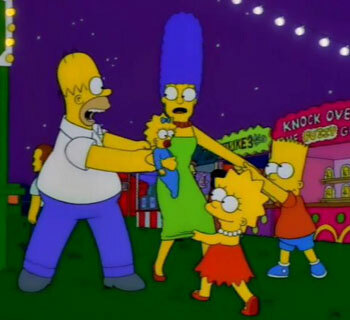 Moe: Yeah, I know, I know, but the bad news is we gotta start having designated drivers. We’ll choose the same way they pick the Pope. Everybody reach in and draw a pickled egg. Whoever gets the black egg stays sober tonight. The nice thing is you can make these zestier, so any chili peppers, garlic, and onions you add only make it better. In the jar, arrange the eggs with sliced beets and red onion. 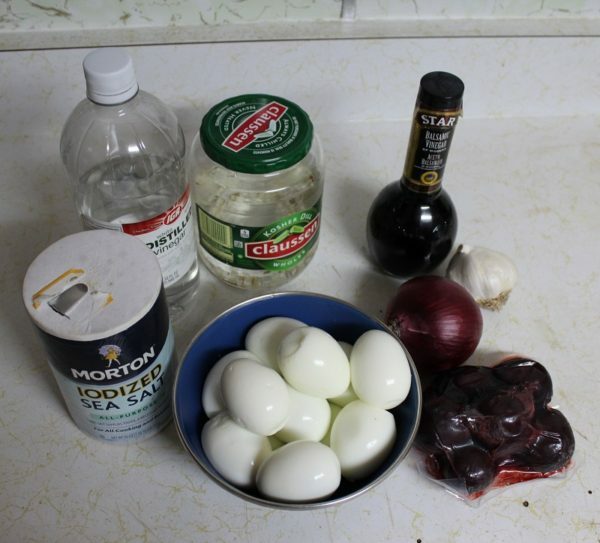 As with the regular eggs, bring the dark brine to a boil and pour it over the eggs. Any spilled brine needs to be wiped up quickly – it’s borderline indelible. Let them pickle for four to seven days in the fridge before eating. 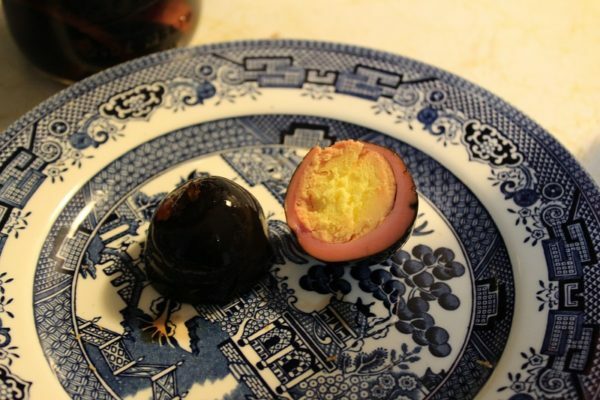 Pickled eggs are an acquired texture, with the white rubberizing a bit as it pickles. The regular eggs could have used a bit more spice, but I surprisingly liked the black eggs. But if the color is off-putting, cut them in half and you’ll see they’re actually just a deep purply red. As a bonus, any onions and beets left behind are good on sandwiches! Does that mean I have to make it on my birthday and complain that “it’s not a very happy birthday for Eats Like A Duck”? Marge and Lisa painting eggs. Did that work for you? amazing…I can’t wait to make the black egg! Just make sure you’re prepared for the consequences if you use it as a means to determine the designated driver. Oh yeah!